Domains: Continuous. Size: 1-D. Kind: Iconic Diagrams (Rotation/Translation). This models represents a timing belt, used for linear positioning. It has a rotating pulley which drives the the belt and clamp. The timing belt is modeled by a series of spring damper elements that convey the rotation of the pulley to a clamp translation. Because the output position is moving, stiffness and damping values are not constant. The belt position is determined by the internal variable x. For x = 0 the clamp is in the middle. When the position crosses the driven pulley, i.e. the simulation is stopped: "Error: clamp position larger than belt end!". When the position crosses the other pulley, i.e. the simulation is also stopped, "Error: clamp position smaller than belt start!". 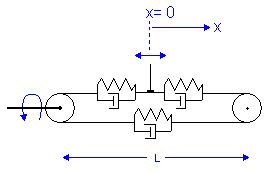 In this model the minimum stiffness is used, based on an output position at a length L of the driven pulley. Take care not to let the clamp get too close to the driven pulley, because the stiffness will then grow to infinity!